A trainee editor at the mystery science magazine "Atlantis". As he is visiting Yamijima conducting solo research the young man becomes caught up in the strange events, and meeting Yuri Kishida is what leads him into the midst of the darkness. In the game, Itsuki has the image of being incredibly interested in the occult and occasionally running wild (? ), but in actuality he is a perfectly sane and completely normal young man interested in modern literary arts. Having got a part-time job at the editing department of Atlantis, his favourite magazine since he was a child, Itsuki pursues his hobby at work, and gets the chance to work on books, which has been his dream more than anything else, and works as hard as he can in the editing department. His passion is acknowledged by his boss, and he takes a job at Super Scientific Research Co. upon graduating from a specialist school (the company generally only hires employees who have graduated from university, so he is a special case). However, though he performs well at his job he has no real-world experience to prove himself as a journalist in things such as setting up his own plans and collecting info or articles. Feeling that neither he or the editor-in-chief will accept him if he simply sits behind a desk, and believing he should be doing more, when called to a meeting he makes unreasonable demands, such as asking to be allowed to go and conduct research in Egypt (for which they actually did not have the money), and running wild due to his youth (of course, his youthful drive endears him to his superiors). Having removed the seals on the "seven gates" and making the descent to the Netherworld, Itsuki is saved by Ikuko as he is about to be sucked in by Mother, and realises that he has been used by Yuri. He takes responsibility for this by destroying the seven stone markers, although he realises that it will do nothing to help the situation and feels an intense sense of blame (naturally, since Mikami and Abe also made the descent together it wasn't just Itsuki's fault). Reaching his physical limits and mentally exhausted he almost gives up, but as he learns the true nature of the Yamirei and Shiryo as he wanders the island (that they are monsters that are weak to light, and can be defeated), he gradually begins to fill with anger towards the one who made this happen. Through meeting Yorito Nagai, a comrade from the same world as him, and Ikuko Kifune, a girl with strange abilities, he regains his strength and uses his unique, characteristic point of view (reasoning) to end the strange events. "Truth of the Yamijima Incident"
The very first solo research assignment given to greenhorn editor Itsuki, known to occult-lovers as "Japan's Bermuda" and "the cursed island", is the Yamijima incident. Yamijima - having several strange incidents in its past such as the disappearance of all of the islanders, the undersea cable cutting and the disappearance of the Hanumaru - is in a way like homework for a new editor, to give them experience (an article that is easy enough to create, and therefore can be left to a newbie). There is also a lot of connected information on the internet. In order to learn the worldview of Siren 2, you must not only play the game but also interpret a variety of things set up online. In particular, in order to get a sense of Mamoru Itsuki's character it is recommended that you take a look at the "tour guide" Sleep Walker, found on the domestic official website, and "Forbidden Siren 2". It seems as though Itsuki had been doing a lot of research into strange incidents happening across the world, and paints a good picture of his over-seriousness as a new editor. After becoming wrapped up in Yamijima's strange incident Itsuki at first seems calm and in control, but as you can see by the way he innocently believes Yuri's strange words and actions he also conceals another side with all of his strength by dealing with the danger that pursues him. As the bizarre situation unfolds, he also falls into a stupor amidst the extreme chaos, due to his imagination running wild as part of his occult tendencies. From her monologue, Itsuki feels (an awe-like) fear towards Ikuko, with her supernatural powers. But Ikuko mistakes his feelings as rejection, and leaves. This prompts Itsuki to face his trauma concerning his classmate Mai Ikeda (for details on her, see the Q&A below), and he decides to meet up with Ikuko and clear up the misunderstanding. During the final battle with Mother, Kanae (Akiko ver.) commits suicide with the Annaki, the Annaki possessed by Itsuki and Ikuko conform to a huge number of rules and change into a sacred implement with the power to return everything to "nothing" (a state only the Annaki can take). It is unknown whether the form they take is a reflection of Itsuki and Ikuko's minds, but as weapons they possess the ultimate power to destroy Mother. Q: What is the "nightmare" Itsuki has at the start of 0:00 "Vision"? 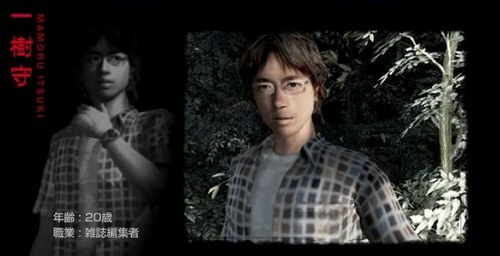 A: It is his feelings of regret towards his classmate Mai Ikeda, at the time a second year middle school student (14 years old), manifesting as a nightmare as a result of him being sucked into the Reflected World. Unable to forgive the unfair treatment of those around her for a physical peculiarity (a birthmark on her chest), Itsuki is careful to make sure that he at least won't treat her that way (he doesn't see her as a lover). However, perhaps Mai had feelings towards him, the only person who understood her, as more than that of a friend. A careless comment said to Mai by Itsuki (with no ill intent, of course) causes Mai to attempt suicide (archive [No.089] "Mamoru Itsuki's Notebook"). Due to this incident, Mamoru takes a feminist stance towards women. Q: When in 16:00 "Resistance" Itsuki rejects Nagai's encouragement, saying, "I'm the kind of person you guys are," is this Itsuki's unique sense of cynicism? A: It is a cynical remark he makes towards Nagai which reflects his feelings towards his status as a member of the SDF, and has nothing to do with his personal impression of Nagai. Of course, this doesn't mean that Itsuki is thinking anything special; the words are simply the slightly biased perspective of the young, showing that Itsuki and Nagai empathise with each other as young men of the same world. Q: In 18:00 "Joint Struggle" Itsuki sees through to the pylon's true form, but how did he know? A: It was just a wild theory that ended up being true; he wasn't really sure of it.